Happy National Chocolate Ice Cream Day! Although we support the OG Ice Cream- Vanilla, chocolate ice cream is where it’s really at for us! 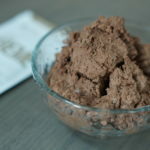 Our Chocolate Ice Kreme is easy, delicious, and most importantly- Keto Apprüved! Dark chocolate + KETO//KREME® mixed together for a frozen treat is the perfect way to beat the summer heat! Melt dark chocolate and butter together in microwave for 2-3 minutes, stirring every 30 seconds. Pour mixture into large freezer-proof baking dish and let cool to room temperature. Using a mixer, beat the egg whites and cream of tartar until thickened. Slowly add the powdered Erythritol to egg whites until stiff peaks form. Gently fold egg whites into cooled chocolate. Whisk together egg yolks with vanilla and slowly stir into chocolate mixture. Whisk the heavy whipping cream and KETO//KREME® together until soft peaks form. Freeze 4-6 hours or until set. How do you like to serve your chocolate ice cream?! Post a picture to Instagram or Facebook, tag us @justpruvit #ketocooking so we can your Chocolate Ice Kreme! Do you have another amazing keto recipe?! Email it to us at yum@pruvithq.com and we’ll feature it on our blog!